The indoor and outdoor facility means that there’s water action for all weather at the Lido. Inside there is a leisure pool, 25m lap pool, 2 hydroslides, toddlers’ pool and dedicated teaching pool. Outside there’s a 50m pool, separate leisure pool, 2 hydroslides and a dive well. There’s also an outdoor Aqua Play area with regular slides that have running water on them, water sprays etc all on rubber matting (no standing water in this area). Some reviews suggest that the pools can be cold for little ones (both inside and out) so perhaps go prepared with a wetsuit if you have one. The pools are supposed to be roughly 29-30 degrees with the toddler pool being around 33 degrees. There is a warmer spa pool (38 degrees) but it’s for 16 year olds+. An inflatable AquaRun is up in the leisure pool for part of the weekends and during the school holidays (1-3pm) which can be fun for older kids but an additional charge is made for using it! Some have said that with all the additional charges, this pool can be very expensive for the whole family to visit (unlike some pools where adults with preschoolers don’t pay the full rate, this doesn’t apply here) but if you phone to check that all the facilities are open before you go and you go prepared with food or eat at the cafe, you can spend a good portion of the day here, in which case, it’s hopefully money well spent! 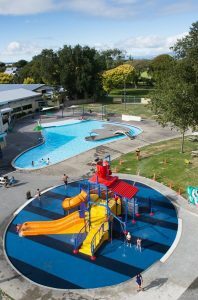 For older kids (ages 8-15 years) Friday evenings are disco ‘Wave Rave’ nights with the AquaRun and Hydroslides both operating from 7-9pm (hydroslides close at 8.30pm). Address: Park Lane, Palmerston North. Open: The pools are open Monday – Friday 6am – 8pm (till 9pm Friday) and Saturday & Sunday 8am – 8pm. The Hydroslides operate Monday – Thursday 3.30pm-7.30pm, Friday 3.30pm – 8.30pm (when there’s the Wave Rave). Saturday, Sunday, Public Holidays & School Holidays 10am – 7.30pm. Hydroslide restrictions: Indoor 8 years+. Outdoor Superbowl is for 1.07m+, and SpeedSlide for 1.22m+ and for both outdoor slides kids under 8 years old must be accompanied by someone 16 years or older. Prices: Pools only Adults $5, Kids $4, Family Pass (2A+2K) $13.50. Slides are payable in addition to pool entry Indoor slide only $5. To use the outdoor slides, you pay for a day pass for all slide use: $12 (+pool entry) or $11 if paying for 3 or more people (+pool entry).